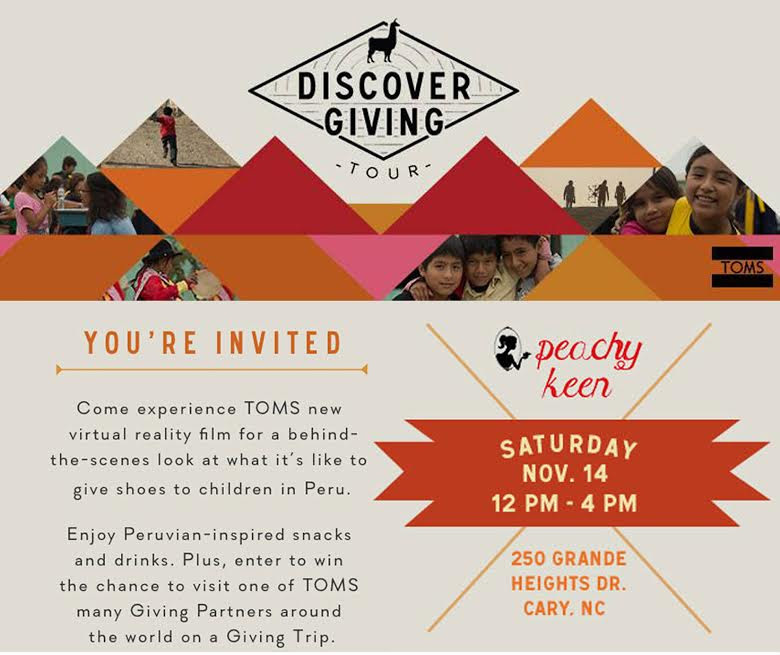 TOMS Discover Giving Tour Stopping at Peachy Keen on Saturday! The TOMS Discover Giving Tour is coming to Cary! On November 14, from 12:00-4:00, be sure to come to Peachy Keen to get a taste of Peru through refreshments and a virtual video that shows you what an impact TOMS shoes is having on the lives of children in the country. TOMS Giving Tour coming to Peachy Keen! TOMS promotes One-for-one giving. Meaning, for every pair of shoes you buy from them, they will donate a pair to a child in need. Living without shoes is a huge detriment to children in Peru. TOMS is truly making a difference through each pair of shoes they sell. KocinA Grill and Food Truck’s will be providing delicious South American Tapas & Brews for free!